Make sure to check out the beautiful tables at the end of this post. To show off the hydrangeas the table was set with white dishes. 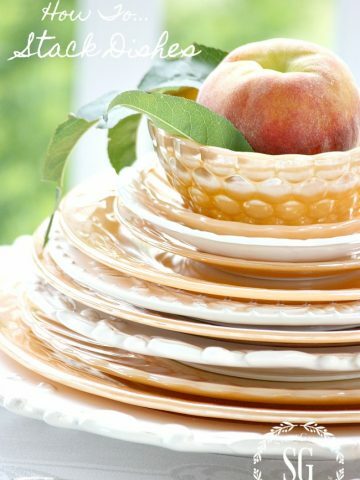 I love love love dishes with interesting edges so a stacked a trio of my favorites! To keep things simple I used one of my favorite napkins and tucked it between the plates. I’ve had these napkins for over a decade and keep going back to them again and again. I think it is the mix of soft and natural colors! One of my signature touches when I set a table is to mismatch something. Today, it was the silver. It’s so fun to have something a tad unexpected! And I didn’t polish it either! I’ve been using it slightly tarnished… love the patina! 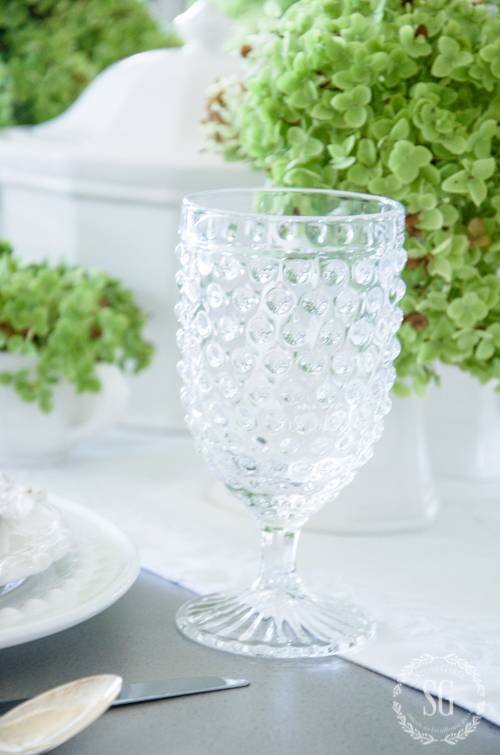 There is something so charming about these hobnail glasses. 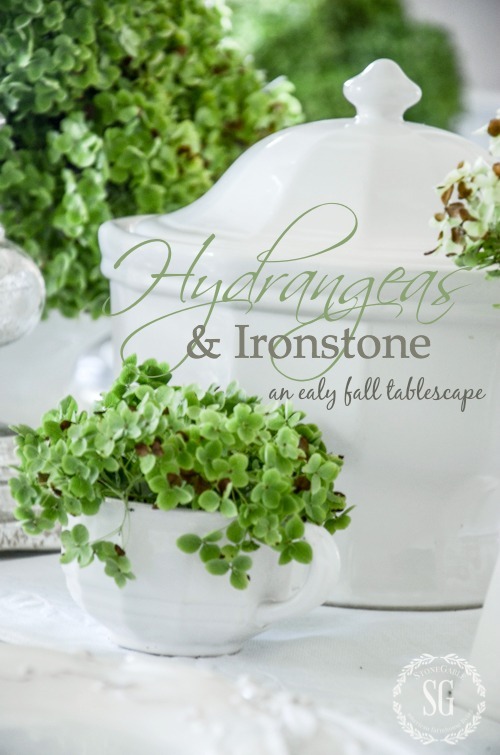 They work so well with hydrangeas… and ironstone! 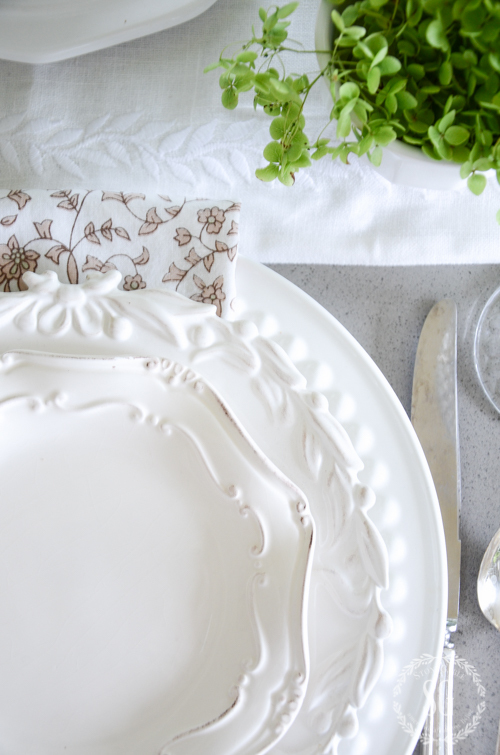 A white linen runner with embroidered white leaves works as a backdrop for the ironstone that runs down the center of the table. Hydrangeas can show up in the prettiest places! Some of my sweetest girlfriends came over and had lunch among the hydrangeas and ironstone! See an easy way to preserve hydrangeas… click HERE. You may like to follow me on Pinterest and see what I’m finding to pin every day HERE! You have the most exquisite taste in everything you So! So inspiring? the green flowers and then dried them in the Fall. It brought a little bit of home back for us. The dining room set up is absolutely beautiful. My favorite flower, hydrangeas, I do not own one but think it is time to make the purchase! I just went and ordered an Annabelle Hydrangea! Jealousy!!! Good morning Yvonne. I know you talked about napkins before in one of your Practically Speaking posts but it more or less centered on how you stored them. I’m wondering how do you fold them to get them to fit on your plates? I don’t know if mine aren’t the right size or what but I’ve just spent 30 minutes or so playing around with one of my napkins trying to get it to look like yours and get it placed right between my dinner and salad plate and for the life of me I can’t. Neither the side to side folds or the top to bottom. Especially the top to bottom, I end up just way too short. Unless when you fold down you’re not folding it totally in half. Please help! Great post – my favorite time of year when my hydrangeas turn green. I LOVE your new feature “get the look”. So helpful if you see a product you want to check out. Keep on being your amazing self – it’s not a good day till I “visit” Stone Gable!! I love the clear hobnail glasses. They look so lovely with the white dishes. Delightful and inviting. i actually stumbled upon your doorstep while looking at tablescapes. You can imagine my delight to discover your beautiful home and lovely suggestions. I now visit almost daily and have to say, you always make this visitor feel so welcome. Very elegant! I love hydrangeas but have never grown them. Today I had lunch with my sister and she brought me a big hydrangea blossom — green! — from one of her bushes. Love it! A while ago I was wanting some hydrangea blossoms so badly that I actually bought some! Me, who never buys artificial flowers, but these are quite nice and I have enjoyed them. But the real one will be better! I love white dishes and think your tablescape is very pretty with the different-edged plates stacked like you have them. And the menu for your girlfriends sounds yummy! Gorgeous, Yvonne! There is nothing like a hydrangea to make a table sing! 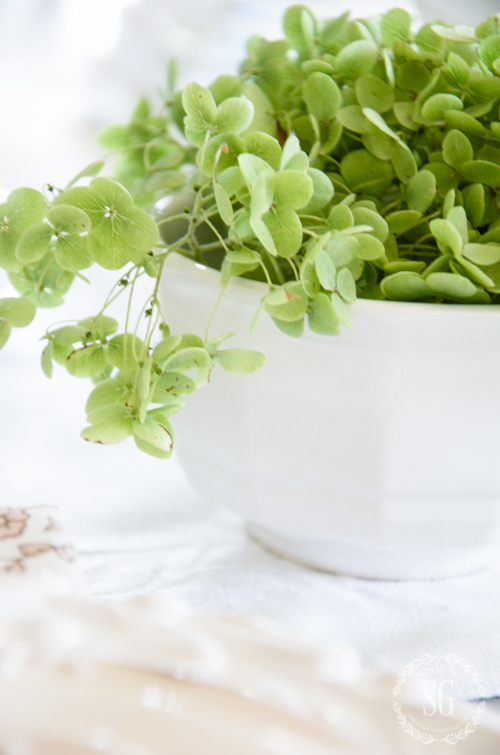 I love the simple pairing of the white ironstone and the greenery — just beautiful!! I so love your vignettes with hydrangeas! You so inspire all of us! I dried my hydrangeas last year and fell in love with the color of them as they dried! The table is so pretty. I love white pieces and the hydrangeas and the ironstone down the runner is a great idea. Very nice. Beautiful!! Love theses favorites paired together. Thanks for the great inspiration! I have tons of green hydrangea. My bush is about 15 feet across and should be white flowers, it’s just a plan old fashioned hydrangea bush, but for some reason they only stay white for a week or two and then they turn just as green as your hydrangeas. I wish they would stay white, it would look better with my house, but the green blooms sure do look good with white plates. Looks like I have to cut some green hydrangeas and bring them into the house! I’m loving the ironstone and clear dishes!! I love the touch of autumn (my favorite season!) with the brown in the napkins. Summer has been brutal the last couple weeks here at the Mason/Dixon line – so ready for fall! What a dreamy table. Just beautiful! My hydrangeas start out white and then turn a lighter shade of green but I love your vibrant green color! Always so much fun to see your work! Yourtablescapescare always my favorite. Beautiful. 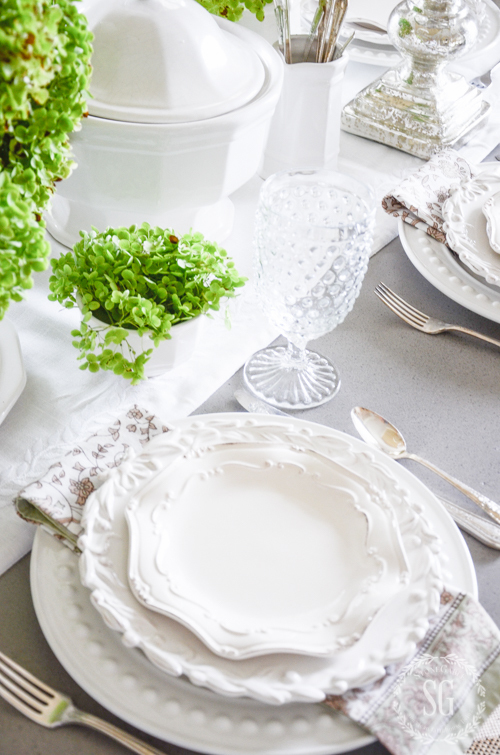 Lovely dinnerware and hydrangeas! I share your love for blue and white dishes! I’ve never seen those before Yvonne…as usual, so well styled! Gorgeous as usual! I have white ironstone and collect white milk glass. Looks good with all décor. Love it! 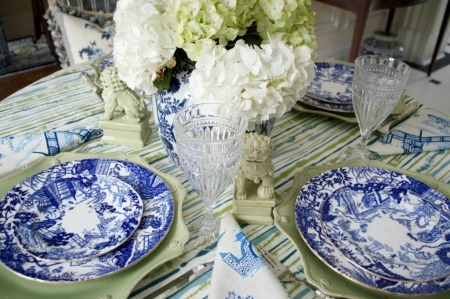 Love your ironstone and hydrangea tablescape! You always have such creative ideas that make for beautiful table settings. Thanks for sharing…. My home and count my blessings. Love your blog! That crisp bright green really sets off the table! Wish I had room in my little bitty yard to grow one! I’ll just have to enjoy yours! This is only my second day of being a member of your blog…..and I’m hooked! I can’t wait to see what your post is each morning!!! 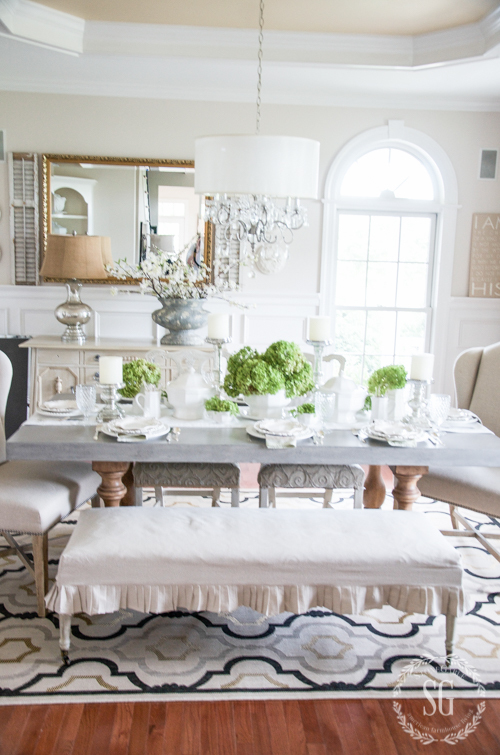 Today you have two of my favorite things….hydrangeas and tablescapes!! I feel like your article was written for me!!! I can’t wait to see what tomorrow brings , and also, looking forward to the corn chowder recipe!!! WELCOME to the StoneGable family Emily! 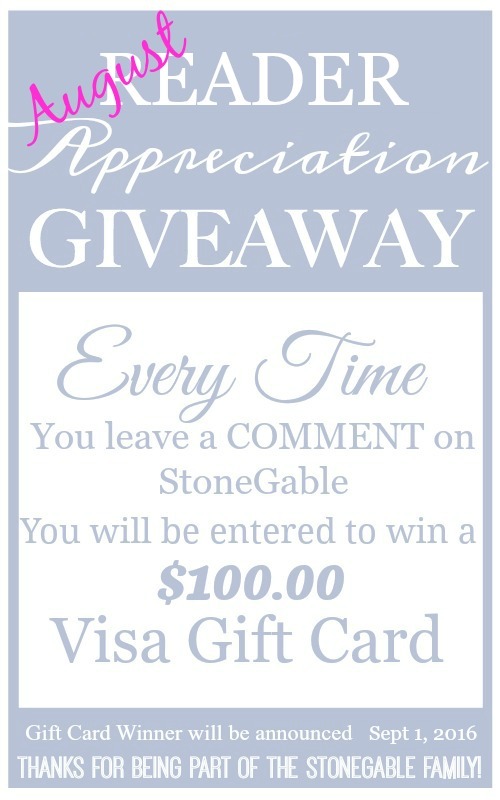 I’m so glad you are enjoying StoneGable! Thanks for letting me know! Thank you so much for your blogs each day. I look forward to reading all of your great tips and inspiration. Your Table looks so pretty and inviting… Love your hydrangeas, looked at all the tables scapes and they all looked nice. Beautiful tablescape! I love the hydrangeas, too! A beautiful table Yvonne. The hydrangeas are exceptional! Love the tablescape! Swoon!!! I would love to try planting these beautiful Annabelle’s. Just wanted to mention that every time I attempted to type in my comment, the Pandora ad pops up and blocks the comment box and I can’t see what I’m typing. I love your use of white dishes. Your table always looks amazing! Very pretty table setting. I love the flowers and love that shade of green ! Love hydrangeas! Wish I could grow them in South Texas. Look forward to your posts each day. What a beautifully set table! Your friends are so lucky! My best friend is visiting from NC this week, and I have had fun using many of your ideas for making her feel welcome in my home. 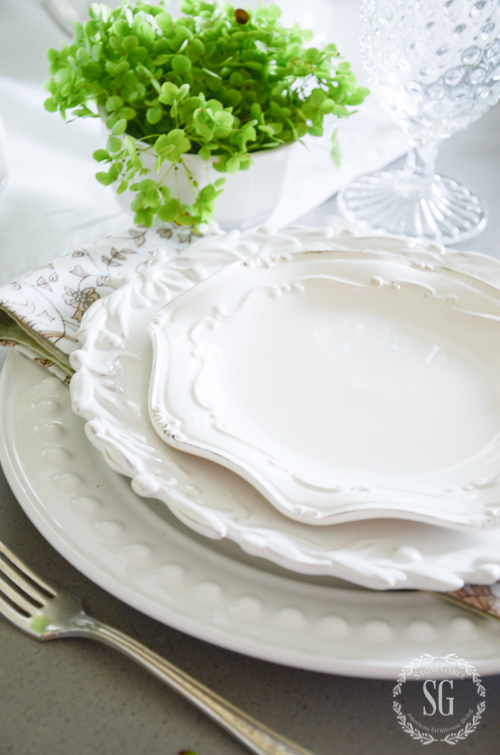 I clicked your link over to Pier One and they have beautiful white dishes ON SALE! I think a shopping trip just may be in order! Thanks! 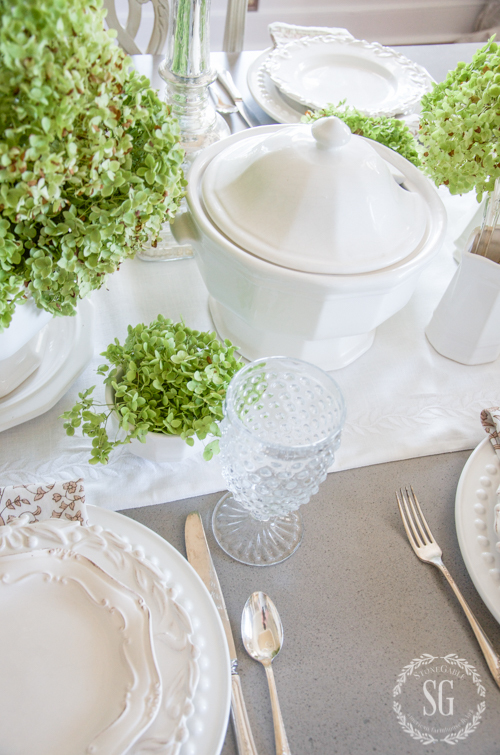 Yvonne, one of my most favorite tablescapes that you have done! The white and green look so fresh and clean together! Like a bright summer day. I love, love, love hydrangeas!! !They are one of my favorite flowers. I’m in process of adding more to our landscaping year by year. And I love seeing all your inspiring ideas on how and where to use them. I have some that are ready for picking also – will be doing that later today and putting them in the center of the dining room table. As always, Simple and so Elegant!!! Menu sounds Scrumptious!! You’re using one of my favorite flowers. Your arrangements would look gorgeous with my blue & white “Bleu Willow” and with my (powder blue & sage green) formal china pattern, Noritake’s “Monteleone”. Actually, since you’re using GREEN hydrangea, ANY china will look wonderful. Green is the color of grass & leaves. Don’t all colors in the garden look good with green? I also love your green hydrangea in a brown basket, too. Your green & white tables cape is a great look for fall, winter, spring, & summer (with or without additions of seasonal touches)!!! 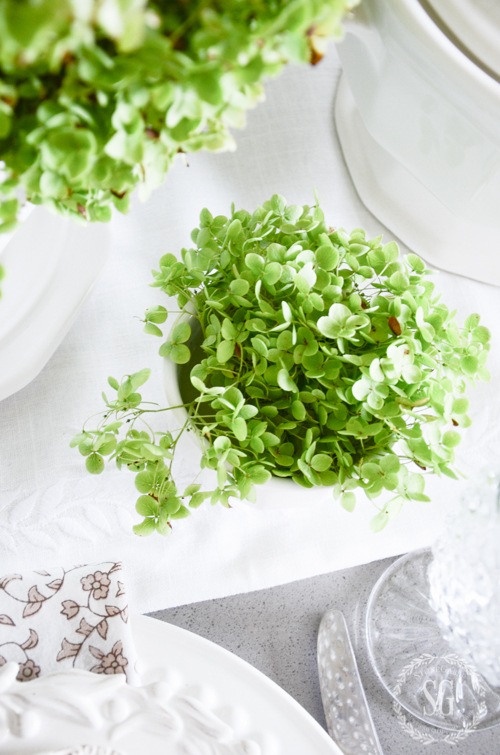 LOVE the freshness of green and white! So crisp and clean!! Your flower are beautiful Yvonne!! Oh, I just love your Hydrangeas with the white. I live in a very hot climate and my hydrangeas really don’t fare well. I love the green hydrangeas mixed with purple/lavender flowers…one of my favorite combinations. Thanks for your lovely inspiration. I am rather green with envy. I love hydrangeas but they are a plant that doesn’t do well in Phoenix. I have to be happy with florist hydrangeas or pretenders. It is a joy to see the beauty of your table. Keep inspiring us! I love hydrangeas and I have the ironstone collection to go with them. I need to move mine in the yard. They don’t get large enough to blossom in my area each year, and I think they need more sun. Thanks for the inspiration! Hi Yvonne! 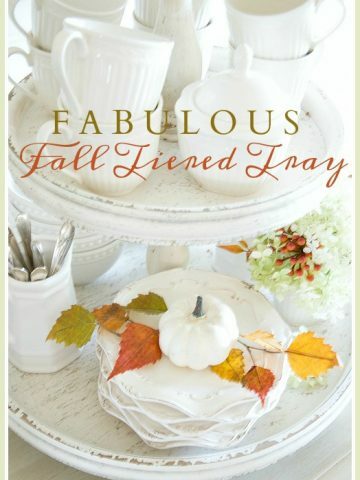 I love all your tablescapes and I have been collecting them on my pinterest board! I’ll be on the look out for your corn chowder recipe! 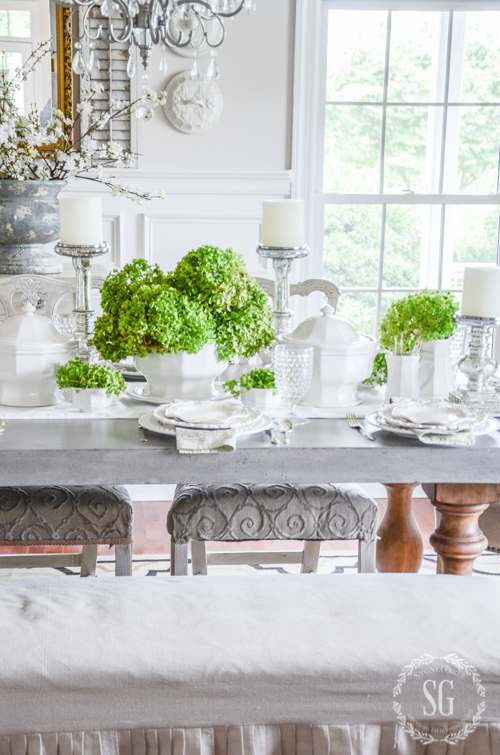 Love the ironstone dishware and the use of the mercury glass candle sticks. Of course everyone should use hydrangea’s. I love your green color. I need to investigate that type and see if I can locate it here in Texas. Thanks for the eye candy!!!! Love the white tablescape – and the hydrangeas! Lunch sounds wonderful – I have my grandmother’s recipe for Apple Cake and all time favorite! It’s very similar. Thank you for the inspiration. I absolutely LOVE the purity of the white backdrop against which you set those glorious green hydrangeas! What a welcoming pretty table… 🙂 I also love the bit of glimmer added by the glassware, as well as the mixed silver. Just lovely! And such a yummy menu!! Thanks for sharing! Absolutely stunning tablescape! I just love hydrangeas. It has been a great year for hydrangeas here in my area. I, too, have one hugging my front porch and it has produced enough beautiful flowers for me to fill my house for a couple of months now. Last year I only had one bloom so this has been very exciting! Hydrangea is by far one of my favorite flowers and I have several of them growing in my yard (pink, white, and lime). You’ve inspired me to come up with a new table setting for dinner tonight – now I just need to get busy! Thank you for sharing! Your tablescape is gorgeous! I love the green and white colors. Just beautiful!! I hope that you are having a wonderful week! I love, love, love hydrangeas! I am nursing some that are fairly young at our new house we just moved into in early spring. As always, you set a gorgeous table! Thanks for the inspiration. Your site is such an inspiration. I look forward to your beautiful pictures and creativity EVERY day. Always makes me smile. The Hydrangeas are amazing .. as well as the entire tablescape!!!! BUT OH THOSE PLATES…. The scalloped edges are gorgeous!!!!!! Beautiful Yvonne. I love hydrangeas and really enjoying mine this year after two years of none. You never know what nature will give you today so enjoy what she gives. Love your choice of colors! Hydrangeas are my favorite flower! This is one of the prettiest tablescapes. 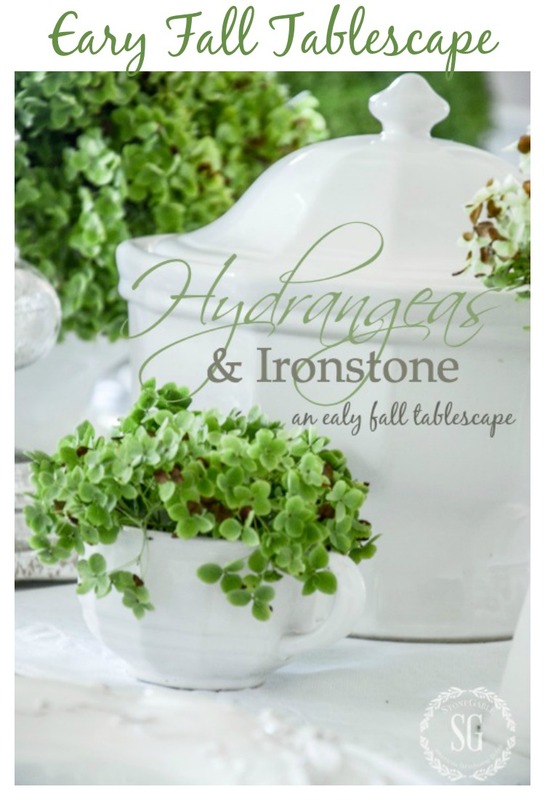 I love the white ironstone and the green hydrangeas. I miss having them here in Florida. Your white stoneware is beautiful. I have been bringing my hydrangeas in and enjoying them also. It is nice that they stay for so long when you bring them inside. All the tablescapes are an inspiration. Hi Buttons, welcome the the StoneGable family!!! Ironstone is such a great staple on the table and in the kitchen, so many uses I love how you used it. Dear Yvonne, you have displayed many beautiful table settings in the past but this simple, classic beauty is by far my favorite! Spray paint called “fern” that does a great job of bringing green inside! Now I must plant Annabelle hydrangeas outside!!!! Hi Anne, I’m with you, I love love love lime green. It works amazingly well with the colors you mentioned! Beautiful table…..always love your dishes!!! I have Hydrangea envy, I bought one this year, but it died, guess I will try again next year!!! Beautiful table setting!! Beautiful table…..always love your dishes! Love the green and white! My hydrangeas have had a good year! Yours are lovely – the green is so fresh! I enjoyed seeing you in a photo with Anita and friends recently! I love your blog! Can’t wait for the corn chowder recipe! The menu at the end sounds FANTASTIC! I’ll be watching for the Fresh Corn Chowder recipe. We are in peak corn time here at StoneGable. YUMMY! The corn chowder was delicious. to other locations. We are located in Minnesota. Love this table setting, Yvonne. That green looks beautiful with the ironstone. I love hydrangeas. I love the Hydrangeas and white ironstone Yvonne! Lovely! Mine are still blooming which is amazing considering the heat we have had in Houston. Thank you for sharing your home! I adore Hydrangeas! Unfortunately so do the deer. Any suggestions anybody? Hi Judy, I didn’t know deer liked hydrangeas. I’m sorry, I don’t have any suggestions. Google for the answer. My favorite flower! Your table is like eye candy!!! Our wacky spring did a # on plants here in central Va…did not kill the plants, just this years’ blooms. But I did manage to get a few blooms. Your green/ white color combo -very fresh looking. The same happened to all my hydrangeas except my Annabelles and PeeGee’s. They bloom every year. So beautiful! I love white ironstone and ceramics, white plates and pitchers! They go with every single season, no matter what colors you add with them. 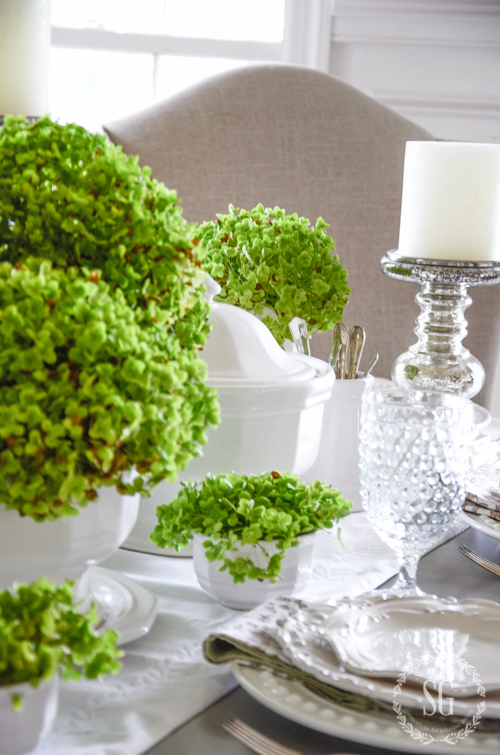 The best foundation for a table setting or vignette. I also love hydrangeas. They don’t like the Texas heat, but they’re so beautiful. I’ve invested in some good quality faux ones for inside my house in some containers because I love them so, and want to enjoy them all year long. I just love your layered plates, they’re beautiful. Great looking faux hydrangeas are an investment but well worth it! Smart idea, girls! Karen, I can relate to the Texas heat & hydrangeas. Thank goodness for the faux ones! I enjoy using them in my decor as well. I have a weakness for Hydrangea’s. I have two beautiful hydrangea bushes in my garden. Last year the produced gorgeous blooms and I was out every few days snipping them to bring indoors. This year, the bush is doing well, but did not produce any blooms for me. I’m babying it in the hopes that next year it will bloom once again. I’m with you regarding the white dishes. I, too, have a weakness. I love the contrast in design and different edging on the plates. Another wonderful post! Love, love, love this stunning tablescape. Too bad the Annabelle’s don’t bloom in March for St. Patrick’s Day, eh? Those hydrangeas are truly beautiful!! I love them best when they’re green like that. have small green spiders that like my hydrangeas. How do get rid of my insects and how do I dry these flowers? 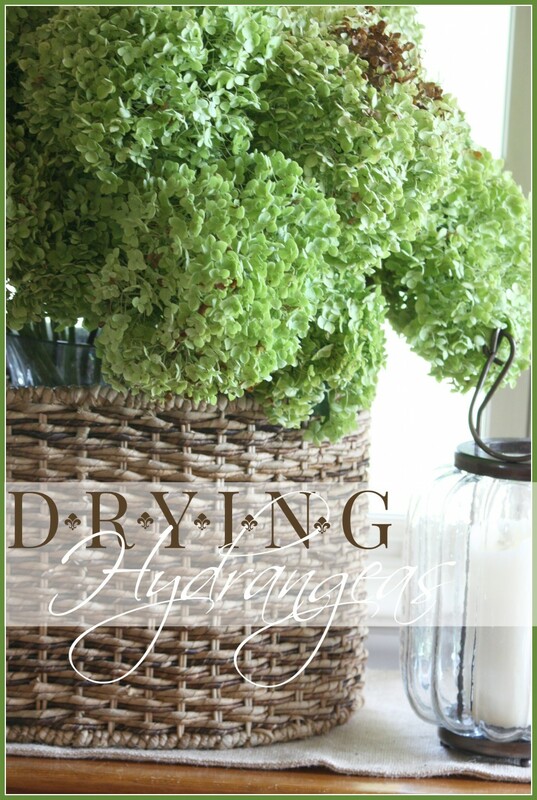 You can see how to dry hydrangeas here:http://www.stonegableblog.com/drying-hydrangeas/. As far as insects, they are just part of bringing the outdoors in! I LOVE Ironstone! Thanks for the great post! I have cut some of my limelight hydrangeas and am vase drying them as you suggested but my Annabelles have some growing to do. Just planted last year with a plan for a thick hedge against my back fence. Love your combo of. Ironstone and hydrangeas. Will have to copy your ideas as always! I love ALL hydrangeas and my new favorite is the Vanilla Strawberry! Thank you for sharing your beauties! My hydrangeas are in full bloom too. 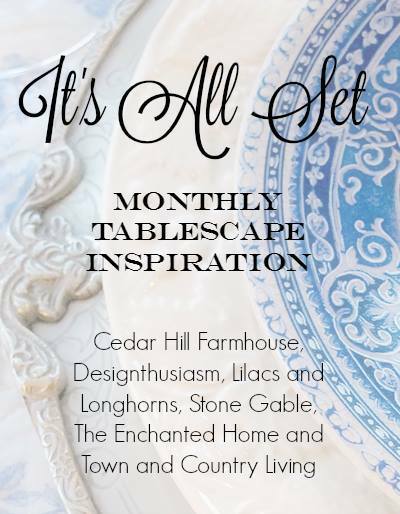 Love your tablescape inspirations, just delightful! Love hydrangeas. Such a sweet table for your guests to enjoy! Recently tried to dry some and had an epic fail for some odd reason. My mom had a gorgeous bush this year! Hoping that I can pull some more and try again.i have dried them in the past with success. Hi Barbara, Our other varieties of hydrangeas did not do well either. The Annabelle’s seem to do well no matter what! I can always count on them. I am experiencing some serious hydrangea envy right now! We had a late frost that destroyed my gorgeous tree and our blue bush has three flowers. As always, I love your posts and look forward to seeing them every morning!